Indigo is a powerful Mac-based home control server that integrates an assortment of popular Z-Wave®, INSTEON and X10 hardware devices, as well as a variety of other hardware via 3rd party plugins, to provide monitoring and control of your home. Depending on your needs and budget, you can create a simple system that controls only a couple of lights or you can automate your entire home. We recommend that you read through all of the topics in this Introduction section to get a firm grasp of the pieces required to begin your home automation experience. Mac OS X 10.7.5 (https://en.wikipedia.org/wiki/Mac_OS_X_Lion) or higher. Any Mac capable of running Mac OS X 10.7.5. Indigo requires that you leave your Mac running all the time (though the display can go to sleep) in order to control your home automation so you should plan where you are going to locate your Mac. The other major piece of the home automation puzzle are the devices that you want to control. Lights, thermostats, sprinklers, door locks, motion sensors, alarm panels, A/V equipment, etc. Indigo supports a large variety of these devices. Z-Wave is a very popular home automation technology that's used worldwide. There are many different manufacturers of Z-Wave devices so the selection is quite good. To use Z-Wave with Indigo, you'll need a Z-Wave interface (often referred to as a dongle): Indigo supports Z-Wave via the Aeotec Z-Stick Gen5 interface. Other USB and serial Z-Wave interfaces (such as those from GoControl and HomeSeer) also work well with Indigo. Other device types will be added over time. Check our Supported Z-Wave Module List to see if a specific module has been tested. Note however that just because a module isn't listed doesn't mean that it won't work - Z-Wave is architected such that devices that correctly support Z-Wave features should automatically work. There are so many different devices from many different manufacturers that we will never be able to test them all. If you have a device that isn't listed but works, please feel free to report it to us and we'll add it to the list. There is a very simple mechanism to report devices, described in Editing a Z-Wave Device's Properties towards the end of that section. PowerLinc Modem 2413U and 2413S (with serial to USB adaptor) - these are our recommended interfaces since they support both power line and RF transmission. They also support the legacy X10 protocol. PowerLinc Modem 2412U and 2412S (with serial to USB adapter) - these interfaces also support the legacy X10 protocol. Indigo supports the vast majority of INSTEON devices - see our Supported INSTEON Devices List for a complete list. If you don't have any of the above hardware, you can still install and use Indigo - particularly if you have hardware supported by one of the many 3rd party plugins. For instance: RFXtrx433 with support for Home Easy/Chacon, X10 RF, LightwaveRF, and many different types of sensors; Nest and Aprilaire Thermostats; Alarm Panels; A/V equipment; etc. See our plugin list for all available 3rd party plugins. Indigo also ships with some useful plugins out of the box. For specific questions or discussions on the hardware above, we recommend you join us on our online forum. Now, you know what the parts of your system will be and where to go for more information and help. Now let's get started with the actual installation. A ReadMe.html file - read this for any late breaking information about Indigo or the installation process. The Indigo Installer.pkg file - double click this to start the Indigo installation. Follow the instructions provided by the installer. On the Installation Type screen, press the Install button (do not use Customize) to install all the Indigo packages (Server, Server Scripts, Drivers, and Client) on your designated hard drive. 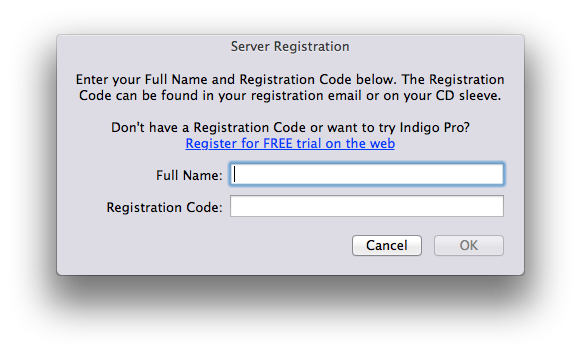 Note: you must install and run Indigo from an account on your Mac that has administrator privileges. By default database files are stored in the Databases folder in that folder. Note: this is the Library folder at the top level of your hard drive, not the one in your User folder. Lion and greater hide these folders by default, but if you select the Go→Go to Folder… menu item in the Finder and paste in the path above it will open that folder in a Finder window. Note: this is the Library folder at the top level of your hard drive, not the one in your User folder. Use the Go→Go to Folder… menu item in the Finder and paste in the path above to get there easily). Time Machine will do this by default. To recover, just recover that directory and then run the Indigo 7 installer again (which will repair any permission issues that Time Machine may have introduced). In addition to the automatic upgrade logic described below (for upgrades from Indigo 6 and ealier), the installer is now smarter and moves previously installed control page images and web server plugins to the new instsall location. Shut down the Indigo Server by selecting the Indigo 7→Stop Server menu item in the Mac client. This will shutdown the Indigo Server regardless of which version is running. Quit the Mac client via the Indigo 7→Quit Indigo menu item. Open the /Applications folder on your Mac and launch the version of Indigo you wish to use. This will have it launch the correct version of the Indigo Server when it starts. Once you are sure you are ready to run the latest version of Indigo can delete (backup first!) the older Indigo Server install paths in /Library/Application Support/Perceptive Automation/ and client applications in /Applications. Indigo will automatically copy your old preference file into the new location during the installation. Indigo will also copy over any enabled and disabled Plugins from Indigo 6 or 5. If a newer version of a plugin is included in Indigo 7, then it will automatically be installed and used on launch. Your old Indigo database file will automatically be converted to the new Indigo 7 file format on first launch. A copy of your database will automatically be made before it is converted, but any changes made in Indigo to your database will not be available in older versions of Indigo. NOTE: Do not replace the Indigo 7 versions of any file with your Indigo 6, 5, 4, 3, or 2 files. They have been modified to run optimally under Indigo 7. Indigo will automatically copy your old preference file into the new location on first launch. Your old Indigo database file will automatically be converted to the new Indigo 7 file format on first launch. You will be prompted to save the new copy of the Indigo database file. The Indigo 7 file format is not compatible with Indigo 1.x. You should not replace or delete your older Indigo 1.x database file. Any changes made in Indigo 7 to your database settings will not be available in older versions of Indigo. You will need to manually copy any of your custom script files. You only need to move the files from the Indigo 1.x location ([~your user home folder]/Documents/Indigo User Data/Scripts/) to the new folder specified above if you modified or added new script or script attachment files. NOTE: Do not replace the Indigo 7 versions of any file with your Indigo 1.x files. They have been modified to run optimally under Indigo 7. If you have only a single Mac, then your installation is now complete and you are ready to start Indigo. However, Indigo has been designed as a client/server application to allow remote control and configuration from anywhere (*extra network configuration is required if you want to access your server from a client over the Internet and is outside the scope of this manual - post on the online support forum for assistance). The client-only installation process installs only the files needed to remotely access the primary Indigo server running on your main Mac. Copy the Indigo Installer.mpkg file to your other Mac. Double click the Indigo Installer.mpkg icon to start the Indigo installation. Follow the instructions provided by the installer process. On the Installation Type screen, press the Customize button and then deselect all the package options (Indigo Server, Indigo Plugins, Indigo Server Scripts, Indigo Drivers) except for the Indigo Client package. Press the Install button to install just the Indigo Client package. Note: It is not necessary to restart your Mac after installing the Indigo Client package only. If you have other Macs on your home network, then you can optionally repeat the above Indigo Client installation on each of them. Now you can start Indigo and configure the server, and then remotely control Indigo from your iPad, iPhone or iPod Touch using Indigo Touch, a Web browser or the Indigo Client. For Indigo 7.1+: deactivate Indigo on your Mac by selecting the Indigo 7(.2)→License Details… menu item and clicking the Deactivate License button. It'll open the correct folder and you'll see the “Perceptive Automation” folder - that's the one you want to copy over. That should get all of your customizations and allow the installer to update anything as necessary. You may also need to install the drivers for the technology you use - see the appropriate section below for details. To uninstall the Indigo Server and all of its data and configuration files, first (for Indigo 7.1+), deactivate Indigo on your Mac by selecting the Indigo 7→License Details… menu item and clicking the Deactivate License button. Then make sure that you have the server and client completely shut down (select Stop Server from the Indigo 7 menu if the server is still running before you quit the Indigo Mac Client). Note your Mac has two different Library folders. One is in your the home directory of the account Indigo runs under and the other is at the root level of the drive. In Mac OS X Lion and higher the user's home Library folder is hidden in the Finder so you'll have to use the Go to Folder… menu item in the Finder and type in the path (~/Library/Preferences) which will open a Finder window to the Preferences folder. If you remove the Mac client application before shutting down the server, then delete the rest of the files above and reboot. Indigo can run as a standalone application or can be run in a client/server mode. The latter allows the server to run invisibly in the background without the client application UI showing and is the recommended option. Regardless of which you are doing, the first step after installation is to launch Indigo and configure the local server. Double click the Indigo 7.2 application (/Applications/Indigo 7.2.app). If this is the first time to run Indigo 7 on this Mac, then press the Start Local Server… button in the connection status window. If you want to reconfigure the Indigo Server on a Mac already running Indigo, then select the Indigo 7→Start Local Server… menu item. 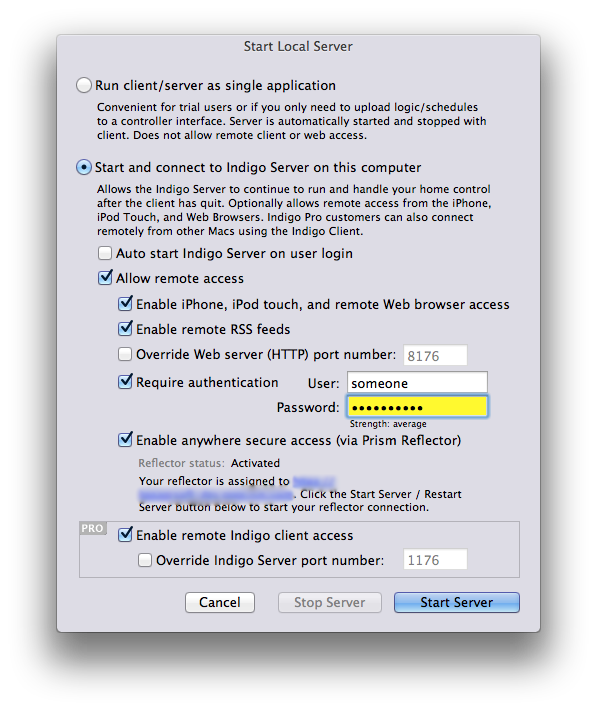 If you only have one Mac and do not wish to remotely access Indigo from a Web browser, iPhone, or iPod Touch, then you can choose the Run client/server as single application radio button. This will automatically run the client/server as a single application. This requires that the Indigo UI always be running on your Mac - when you quit the Indigo 7 Client application (Indigo 7→Quit) all Indigo event processing (triggers, schedules, scripts, etc.) will cease processing. This is not our recommended configuration. NOTE: Indigo Server must be running to use Indigo Touch or to access the Indigo Web Server. Choose the Start and connect to Indigo Server radio button to start the Indigo Server process independently of the Indigo Client. This will allow the server to run in the background on your Mac with no visible UI, even when the Indigo Client is not running. This will also start the built-in Web server, allowing remote access from Web browsers on other computers and remote access from iPhones and iPod Touches. Use the Auto start Indigo Server on user login checkbox to have the Indigo Server automatically launched whenever your current OS X administrator user account is logged in. This option will also make sure the Indigo Server process is automatically relaunched if it crashes. Use the Allow remote access checkbox to enable remote access from other Macs and Web browsers. Use the Enable iPhone, iPod Touch, and remote Web browser access checkbox to allow Indigo Touch (must be downloaded from the iTunes App Store) and remote Web browser access from other computers. Any modern Web browser (Safari, Firefox, Opera) on any computer that has internet access to your server Mac will be able to control and check the state of your home. Use the Enable remote RSS feeds checkbox to turn on the RSS and Atom server feeds, giving you RSS/Atom access to the last modified time stamp of all Indigo Devices. Use the Override Web server (HTTP) port number: checkbox to change the TCP/IP port number that the web server uses to serve content and browsers will use to browse the web control pages. Use the Require authentication checkbox to enable password protection for both remote Indigo Clients and Web browser access. It is highly recommended that you enable authentication and assign a strong password. Use the Enable anywhere secure access checkbox for secure Web browser access from anywhere. This option requires a you to have configured a Reflector, which handles maintaining the secure connection to Indigo Server automatically. Reflectors are included as part of your Up-to-Date subscription. 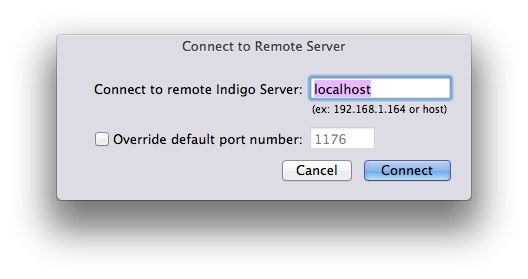 Use the Enable remote Indigo client access checkbox to allow remote Indigo Clients on other Macs to connect to the Indigo Server. Use the Override Indigo server port number: checkbox to change the TCP/IP port number that the Mac OS X client uses to connect to the server. Use the Log Device state history to SQLite or PostgreSQL checkbox to efficiently save Indigo Device state changes, Variable value changes, and Event Log messages to a SQLite or PostgreSQL database. Visit the online support forum for installation and configuration instructions. Press the Start Server button, or the Restart Server button if the server is already running, to start the local Indigo Server. If Allow remote access is enabled, then the built-in Web server will also be started. The Indigo Client will automatically connect to the Indigo Server. 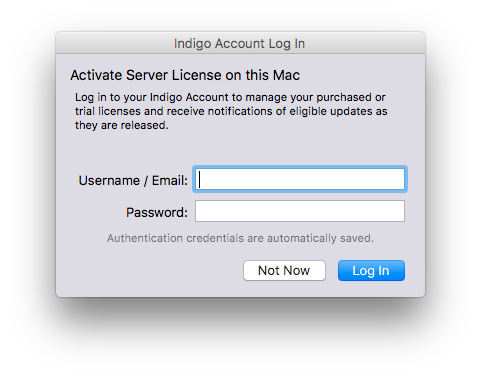 If this is the first time to launch the Indigo Server on this Mac, then you will be prompted to accept the License Agreement and to enter your Registration Code. The Indigo Client will then load and display the current house database file. If you are running in client/server mode, then you can quit the Indigo Client at anytime and the Indigo Server will continue to run in the background processing your home control logic and schedules. Additionally, you can remotely access the Indigo Server from Indigo Clients on other Macs or from remote Web browsers that have internet access to the server Mac. If you are running in standalone mode, then quitting the Indigo Client will automatically quit the Indigo Server. and enter your Indigo Account username (or email) and password. enter you name and registration code exactly as they appear in your registration email (copy/paste works best) and click OK. In either case, the server will continue to start up. If you purchased a retail disk, you should enter your full first and last name along with the registration code exactly as it appears on the label on the disk sleeve. When you click OK you'll be prompted to register your copy on our website. While this isn't required, it's highly recommended. If you don't, we won't be able to locate your registration code in the future should you need it again - and you will to get discounted upgrades to major new releases and access to dot releases. After you have started the Indigo Server in client/server mode, you can remotely access it from other Macs using the Indigo Client, from your iPad, iPhone or iPod Touch using Indigo Touch, or from any modern Web browser (Safari, Firefox, Opera). The following steps explain how to access the Indigo Server from within the local area network (LAN) of your house. Configuring your network to allow Indigo Server access from outside your home (on the other side of your router/cable modem) is more complex and will depend on your network topology, router type, and ISP features (static versus dynamic IP addresses). For this reason, we are only providing instructions on how to get local (in house) remote access to Indigo Server. If you desire easy remote Indigo Server access from outside your home, then you will want to activate the reflector that's part of your Up-to-Date subscription. This provides secure Indigo Touch access from anywhere with no network configuration needed. As long as your Up-to-Date subscription is active you'll have remote access. Alternatively, you can configure your network by consulting your router user manual and, if your ISP does not provide a static IP address, using a dynamic DNS mapping service like DynDNS.com. Because of the potential complexity involved in manually configuring networks and routers for this type of access, Perceptive Automation cannot provide direct support answers about router port forwarding or IP discovery issues. Users having difficulty configuring their networking hardware should post on the online support forum. Be sure and include details about the type of hardware you have and what steps you have tried. In order to remotely access the Indigo Server we must enable the ports Indigo Server uses in the system's network firewall. Follow these steps on the Mac running Indigo Server if you are running Mac OS X 10.7 or earlier (later systems will automatically prompt you if required so you shouldn't need to adjust any settings). Stop the Indigo Server if it is running by choosing the Indigo 7→Stop Server menu item. Choose the Apple Menu→System Preferences menu item. Select the Security preference panel. Select the Set access for specific services and applications radio button. Restart the Indigo Server by choosing the Indigo 7→Start Local Server… menu item and pressing the Start Server button. Mac OS X will now ask your permission to allow incoming network connections for the application IndigoServer.app and Python.app. Press the Allow button for each. The Indigo Web Server advertises itself via Bonjour, so Indigo Touch and Safari (by clicking on the bookmarks icon, then selecting Bonjour) will automatically find any local servers. In addition to that, when connecting to a local server for the first time, Indigo Touch will also automatically fetch Prism Reflector settings for that connection so that you'll be able to connect outside your LAN via LTE/4G/3G/Edge. For other browsers to remotely access the Web server, we need to know the network IP address for the Mac running Indigo Server. This address will be used on the remote Mac or Web browser when connecting to the Indigo Server. Follow these steps on the Mac running Indigo Server. Select the Sharing preference panel. If File Sharing is not turned on, then temporarily enable it. The IP address is the number portion of the URL (ex: 192.168.1.4). If you do not want File Sharing on, then turn it off. You only turned it on to make the IP address visible. You now have the IP address for the Mac running Indigo Server. Depending on your home network setup, this IP address may change periodically, such as when the Indigo Server Mac or router is restarted. If this happens, then you can use the steps above to discover the IP address again, or you can configure a static (not dynamic) IP address for the Mac running Indigo Server. If you haven't already installed the client on the remote Mac, run the Indigo Installer on the remote Mac and on the Installation Type step click the Customize button. 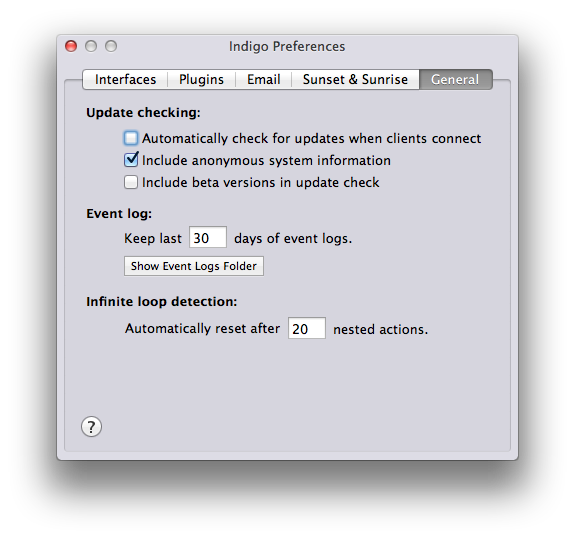 Unselect everything except the Indigo Client line and click Install. Double click the Indigo 7.2 application (inside /Applications/Indigo 7.2.app) on the remote Mac. If this is the first time to run Indigo 7 on this remote Mac, then press the Connect to Remote Server… button in the connection status window. If you are wanting to connect to a different Indigo Server, then select the Indigo 7→Connect to Remote Server… menu item. Enter the IP address for the Indigo Server Mac discovered in the section above. If you overrode the Indigo Server port number (default: 1176) in the Start Local Server dialog on the server Mac, then select the Override default port number checkbox and enter your custom port number. NOTE: the Indigo Mac Client doesn't use the Prism Reflector service. Connecting an Indigo Mac Client to a server over the internet is a complex topic that is well beyond this document – we suggest you search our online forums for others that have configured this type of access. Indigo Touch, the iPhone and iPod Touch application from Perceptive Automation, allows the user to view and control Devices, activate Action Groups, view Variables, and access custom Control Pages. One of the best features of Indigo Touch is it's ability to automatically detect and configure network connections. If your iPhone (or iPod Touch) is connected to your local wireless LAN, then it should automatically discover your server. In Indigo Touch, tap the Settings button. You should see the name of your Database in the list. Tap on it, and it will connect (it will ask for your username/password if you have one set, but it will remember it going forward so you won't have to type it in again). At this point, Indigo Touch will also query the server to see if you have a Prism Reflector account set up for the server. This makes connecting to your home server via Indigo Touch completely seemless. If you have a reflector set up and running, then Indigo Touch will automatically attempt to connect no matter where you are or how you're connected. If you're local, it will use the local wireless LAN, If you're on a remote wireless LAN, it will attempt to use the reflector account. If you're iPhone is on LTE/4G/3G/Edge, it will also attempt to connect via your reflector account. This makes Indigo Touch truly location agnostic! You can, however, configure a connection manually. Simply tap Manually Add Server on the Settings screen in Indigo Touch and you can enter your host/ip address and port number. Indigo, when run in client/server mode, will automatically start its built-in Web server on launch. This allows access from remote Macs, PCs, and other internet devices like the iPhone, iPod Touch, Nokia 770 and PepperPad. Any device that can run a modern Web browser (Safari, Firefox, Opera) will work. Alternatively, if you already have the Indigo Client on a remote Mac connected to the Indigo Server, then you can use Indigo's Go→Browser… menu items to open a new browser page pointing to the built-in Web server. See the using Control Pages section for information on how to create custom browser accessible interface pages. The Aeotec Z-Stick Gen5 uses a built-in driver included with Mac OS X (AppleUSBCDC Modem), so you don't need to install any drivers for it. Note that if you move the stick to a different port or if you upgrade to a new OS version you will need to reselect the serial port. The Aeotec Z-Stick Series 2 interface requires that you install the Silicon Labs VCP Driver Kit for Mac OS X. Make sure you have restarted after the installation process. If you reinstall your OS, then you will need to rerun the driver installer. Warning: Before upgrading macOS to the next major revision, please visit the Announcements section of our forums to see if there are potential issues with the OS update. The SmartStick+ is a serial interface from HomeSeer that also uses the built-in driver included with Mac OS X (AppleUSBCDC Modem), so you don't need to install any drivers for it. Note that if you move the stick to a different port or if you upgrade to a new OS version you will need to reselect the serial port. The GoControl QuickStick Combo is an interface that includes both Z-Wave and Zigbee (though Zigbee isn't supported natively in Indigo). It also requires that you install the Silicon Labs VCP Driver Kit for Mac OS X, specifically v5 or later. It will then present 2 new serial ports: GoControl_zwave (which is the one you select) and GoCongrol_zigbee (for the Zigbee interface). As mentioned before, other Z-Wave Interfaces that support the Z-Wave Serial API may be compatible and those may require other drivers. Plug the Z-Stick into an available USB port connected to your Mac. We've done some testing with this interface connected to a USB hub with favorable results (unlike some other INSTEON and X10 interfaces). However, if you experience any type of errors when trying to configure/use the interface you may try plugging the stick directly into a USB port on your Mac. Tip: We highly recommend that you position your Z-Stick carefully. If you have it plugged directly into your Mac then the chances are that the range is reduced and you may have problems communicating with devices that are physically far away. Also, we recommend getting a powered USB hub that allows the Z-Stick to stand straight up for the best signal. Avoid using USB extension cables as they have been known to cause issues. The default Connection Type of Local (physical) is correct (assuming you've plugged your Z-Stick directly into your Mac). On the Serial Port popup, you should select the serial port titled SLAB_USBtoUART (for Z-Stick Series 2) or one that starts with usbmodem (for Z-Stick Gen5), depending on which Z-Stick version you have. If you have two serial ports that start with SLAB_USBtoUART that means that you have multiple devices that use the Silicon Labs VCP driver - you'll just need to try each one to determine which is the correct port if you don't know beforehand. Unfortunately, that driver doesn't handle multiple devices using the Silicon Labs chip very well, and that number may change when you reboot. Unless instructed by Perceptive Automation support, you should leave the Show debug logging of interface communication checkbox unchecked. Save the Configure Z-Wave dialog. Choose the Interfaces→Z-Wave→Disable (or Enable) menu item to disable/enable the interface. We recommend that you finish skimming this document and the overview document so that you'll get a firm understanding of the basics of Indigo. However, if you want to jump ahead, you can go directly to the document that discusses how to create and manage your Z-Wave network. The PowerLinc 2412U, 2413U, and 2448A7H (Insteon RF USB Adaptor) interfaces should be plugged directly into one of your Mac's USB ports (preferably not into a USB hub port) and require the FTDI Virtual COM Port (VCP) driver to be installed. If you are using Mac OS X 10.9 (Mavericks) or better, it has the driver already installed. For earlier versions of the OS, you can get the driver installer at FTDI's web site - be sure to get the installer that's appropriate for the architecture of your machine (Intel or PowerPC). If you select PowerLinc 2412U/2412S/2413U/2413S/2448 from the Interface type popup menu in the Preferences dialog (see below), then Indigo will alert you if the driver is not installed on your Mac. If you're using a PowerLinc 2412S/2413S with a separate USB to serial adapter, you can ignore that warning alert. Note: there are known issues with the FTDI driver and macOS High Sierra and Mojave on some Macs - check out our blog post for details. The PowerLinc 2414U/1132CU/1132U (all of which have now been discontinued) and CM15A (aka CM15Pro) interfaces should also be plugged directly into your computer (preferably not into a USB hub port) - the Indigo installer automatically installed the drivers for these interfaces. Make sure you have restarted after the installation process. If you reinstall your OS, then you will need to rerun the Indigo installer for the driver. The other supported interfaces (PowerLinc 2412S/2413S, CM11 / HD11, LynX-PLC) are serial based, and will require a USB serial port adapter. If you are using one of the serial based interfaces, then make sure that the latest drivers for the USB serial adapter are installed on your system. Look on the adapter manufacturer's website for the latest driver downloads. If you don't already have a serial-to-USB adaptor, we highly recommend getting one that uses the same FTDI chipset that the PowerLincs use since it seems to be the most reliable. Plug the interface directly into an outlet (with the exception of the Insteon RF USB Adaptor). Do not plug the interface into your computer's power strip because many power strips contain filters that will severely degrade the INSTEON / X10 signal quality being received and transmitted by the interface. Additionally, uninterruptible power supplies (UPSs) can cause signal quality problems. If at all possible plug the interface into a different outlet than used by power strips and UPSs. Signal filters are available to isolate computer power strips and UPSs as well. If you are using the CM11 / HD11 or CM15A interface, then do not install the battery into the interface. Indigo does not support uploading macros to these interfaces so the battery should not be used. 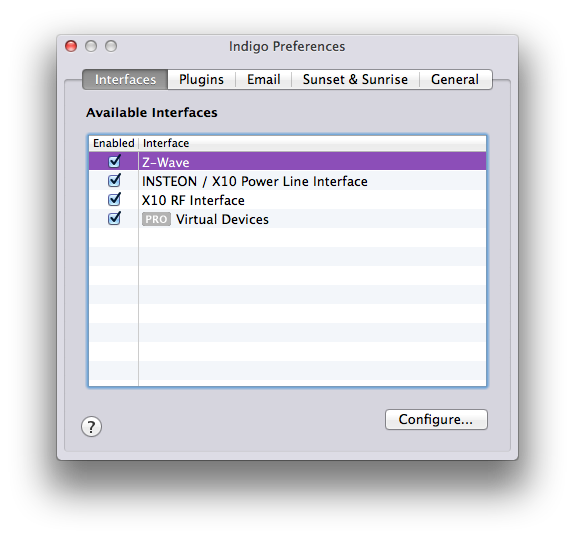 Choose Indigo 7→Preferences… menu, then make sure the Interfaces tab is selected. Select the Enabled checkbox next to the INSTEON / X10 Powerline Interface item. Choose your Interface type in the popup menu. If you are using the PowerLinc 2412U/2413U/2448A7H interface, then the Serial port: popup menu will be enabled and the FTDI driver (see Install the Correct Drivers above) will create a new Serial port: popup menu item that looks like usbserial-XXXXXXXX. Select that item. NOTE: you must have the FTDI driver installed already. If you are using the PowerLinc 2414U/1132CU/1132U or the CM15 interface, then the Serial port: popup menu will be disabled because these interfaces do not use a virtual serial port driver. If you are using one of the serial based interfaces (PowerLinc 2412S, CM11 / HD11, LynX-PLC), then the Serial port: popup menu will be enabled and you should choose which serial port adapter name the interface is connected to in the Serial port: popup menu. NOTE: if no names are listed in the Serial port: popup menu, then you probably do not have the proper driver installed for your USB serial adapter. Download your adapter's driver from the driver manufacturer's website. Optionally select the Group addresses on transmission checkbox to combine like-command transmissions together. For example A1-On, A3-On, A4-On, would be transmitted as A1, A3, A4, On. Some interfaces, such as the PowerLinc V2 and LynX-PLC, have additional settings that can be accessed from the Interface Options… button. Generally, these options don't need to be changed unless you're troubleshooting a problem. 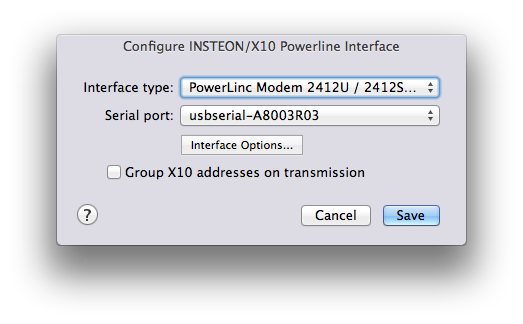 Choose the Interfaces→INSTEON/X10 Power Line→Disable (or Enable) menu item to disable/enable the interface. 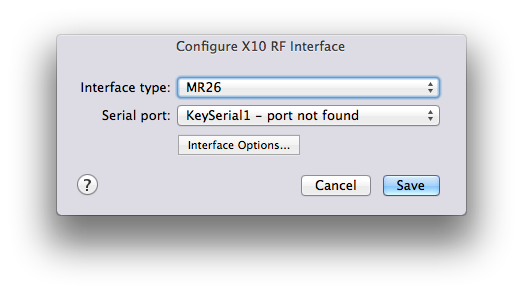 The process for connecting X10 RF Interfaces is basically the same as for power line interfaces - you just need to select the correct serial port. The W800USB will require installing the FTDI drivers mentioned above. You only need to use this interface if you're using a separate X10 RF interface like the W800 or MR26. If you are using a CM15 then enable it in the Connecting INSTEON and X10 Power Line Interfaces section above. You can also enable/disable and configure the various built-in interfaces by selecting the Interfaces→Manage Interfaces… menu item or by opening the preferences dialog by selecting the Indigo 7→Preferences… menu item then clicking on the Interfaces tab. Indigo includes the ability to use plugins developed by 3rd party developers (see our Plugin Store for available plugins). To install a plugin, just download it from the source (the Plugin Store or wherever else you may get it) onto your Indigo Server Mac, then in the Finder double-click the .indigoPlugin file (if the file ends with .zip, then you will have to unzip it first by double-clicking). This will open the Indigo Mac Client application and ask you if you want to install it. If you agree, the first time you install a plugin it will automatically open the plugin's configuration dialog (if it has one). You can also open the config window choosing the Indigo 7→Preferences… menu item and clicking the Plugins tab. Make sure the plugin is enabled (by checking the Enabled checkbox) then double-click on the plugin's name (or select it and click the Configure… button). Again, if this is the first time the plugin has been enabled this will open the configuration dialog for the individual plugin if the plugin supports a one. You can also enable/disable and configure the various plugins by selecting the Plugins→Manage Plugins… menu item or by opening the preferences dialog by selecting the Indigo 7→Preferences… menu item then clicking on the Plugins tab. Shut down the Indigo Server by selecting the Indigo 7→Stop Server menu item in the Mac client (you can leave the client app running). Open the following folder in the Finder: /Library/Application Support/Perceptive Automation/Indigo 7.2/ (you can select the Go→Go to Folder… menu item in the Finder and paste in the path to open a Finder window). In that Finder window you'll see two folders: Plugins and Plugins (Disabled). Depending on whether the plugin is enabled or not will determine which folder it's in. Open the appropriate folder and delete the unwanted plugin. Switch back to the Indigo 7 Mac client and click on the Start Local Server… button in the Server Connection Status dialog. The plugin will no longer show in the Plugins tab or in the Plugins menu. Indigo has built-in support to both send and scan emails. Using this functionality, Indigo can provide remote notification of triggers, such as motion detection or power failures. You can also control Indigo remotely. For example, you could send Indigo an email from your mobile phone to turn on lights or change your home's thermostat temperature. To provide this functionality, Indigo must connect to your email server. 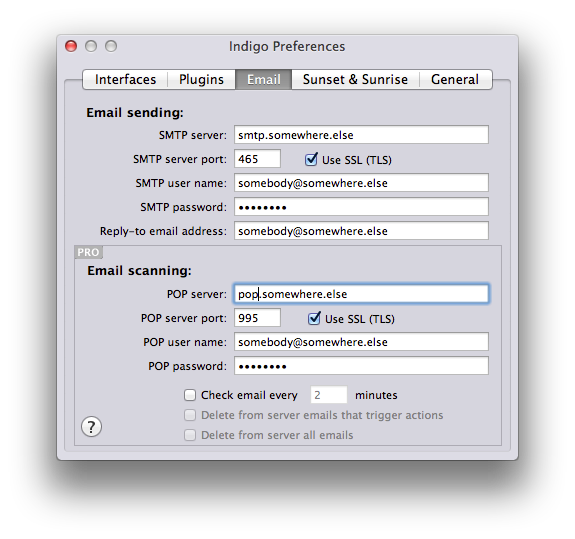 Indigo supports connecting with POP3 to scan emails and SMTP servers (with or without SSL/TLS) to send email. Indigo does not support communication with IMAP servers. Typically, ISPs or other email service providers allow multiple email addresses for each customer. We recommend that you create a new email address specifically for Indigo, such as jetsons-house@myisp.com. Using a separate email address for Indigo will eliminate the possibility that Indigo might trigger an action from a personal email not intended for Indigo, and will allow you to use the Delete from server options shown below to reduce mailbox clutter. Be sure to have the email settings for your ISP handy before trying this configuration. Choose Indigo 7→Preferences… menu item, then make sure the Email tab is selected. Enter your SMTP server address. You probably don't need to change the SMTP server port, but if your server uses SSL (TLS) security, check that checkbox. If you want the recipient of the email to reply to a different email address than the one you're sending from, enter it in the Reply-to email address field. Note that some SMTP mail servers are configured to not send emails unless the reply-to address specified matches the email address for the account. If mail sending fails, then make sure that the reply-to email address matches the email address for your account. Enter your POP server address, user (also called account) name, and password. Select the Check email every checkbox. Enter the time interval to wait between email scans (default 10 minutes). Optionally choose Delete from server emails that trigger actions to have Indigo automatically remove any email messages that cause Indigo to trigger an action from your mail server. You should only use this option if Indigo has a dedicated email account. Optionally choose Delete from server all emails to have Indigo automatically remove all email messages from your mail server. You should only use this option if Indigo has a dedicated email account. Once the Preferences dialog is closed, Indigo will automatically connect to your mail server to scan messages. This will happen within 10 seconds from the time the Preferences dialog is closed. Watch the progress bar in the main window and look for error messages in the Event Log Window to verify that Indigo was able to correctly connect. If Indigo failed to connect, then you can try turning on the SSL (TLS) checkbox option. To have Indigo send an email, create a Send Email action. To execute an action based on a scanned email, create an Email Received trigger. Indigo uses your current Latitude and Longitude coordinates to calculate precisely when sunset and sunrise will occur every day. 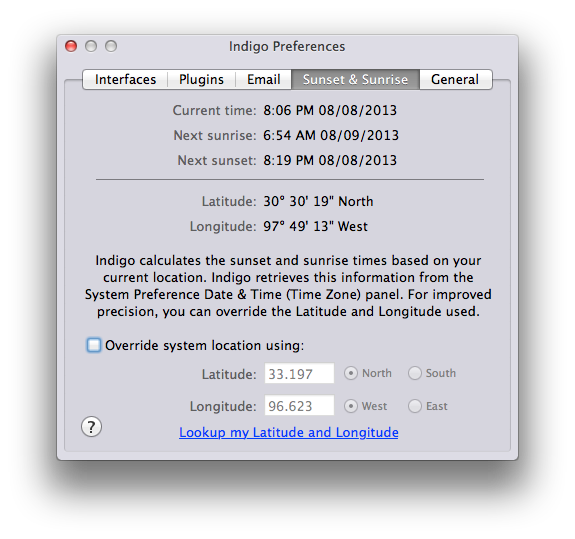 Indigo automatically extracts your location from the System Preferences. Select the Date & Time icon. Select the Time Zone panel. If the current Closet City location is not near your location, then follow the instructions on the panel to choose your location. If you would like to precisely specify your location, then you can override the system location from within Indigo. Choose the Indigo 7→Preferences… menu item, then make sure the Sunset & Sunrise tab is selected. Select the Override system location checkbox. Enter your exact Latitude and Longitude coordinates. You can configure other Indigo settings by opening the preferences dialog (selecting the Indigo 7→Preferences… menu item) and clicking on the General tab. The first section of the tab is about update checking. The first checkbox will have the client check with our servers to see if there's an update to Indigo available when the client first starts up. If there is, it will let you know. The second checkbox will send anonymous information to us (and it really is anonymous) about your install - this helps us to better prioritize what future enhancements to add. The last checkbox will also check to see if there's a newer beta version available - if you aren't interested in getting betas then leave it unchecked. You can have Indigo check for updates immediately by selecting the Indigo 7→Check for Updates… menu item. The next section we talked about above - how many days of event log files to keep. The last section is a rather technical configuration parameter - it is possible to get into an unending (infinite) loop when you're setting up your triggers. For instance, if you have a trigger the fires on a variable change, and it changes the variable to some new value each time, that would cause the trigger to fire again. Setting this value will cause it to stop eventually. Leaving it set to 5 is probably the best idea. Indigo requires your Mac to be on and awake for processing. Select the Energy Saver icon. Move the Computer sleep: slider to Never. Uncheck Put the hard disk(s) to sleep when possible. Select the Start up automatically after a power failure checkbox. Indigo ships with quite a few very useful plugins. We install these plugins disabled so you'll only need to enable the ones you want to use. There are two ways to enable/disable a plugin: select the Enable (or Disable as the case may be) menu item under the plugin's submenu on the Plugins menu. The other is to select the Plugins→Manage Plugins… menu item which will open the Indigo Preferences window to the Plugins tab. Installing 3rd party plugins is a very simple process as well. Congratulations! You should now have a basic functioning Indigo installation that's ready for you to start adding devices and defining your home automation logic. We suggest that you next go to the Overview of Devices, Triggers, Schedules, Action Groups, Control Pages, and Variables - that will give you the information you need to begin using the features of Indigo.